Chillies grow quite well on the Coffs Coast and perhaps we need to know how to extend their harvest - or deal with the glut of ripening fruits! Following are just some different ways to dry chillies to preserve them for further use during the months when they aren't available to pick fresh. If you would like more information on growing HOT chillies, I wrote a post early in 2017 and that article can be seen here. If you had some success with growing your chillies, you'll have to deal with that crop soon. Drying chillies is a very efficient way to preserve them for later use and can be kept for months or even years! Drying intensifies their heat and flavour and these in turn can be pounded down to make chilli salt or mixed with other herbs for rubs. Good results can be achieved by drying - listed here are two ways to do this - air drying and oven drying. When drying chillies only use good quality, fully ripe chillies with no visible signs of damage or disease. Any that aren't quite perfect can be used for chutneys, pickles, jams, sambals etc. It is worthwhile to remember that the larger the fruit, the longer it will take to effectively dry out and care should be taken that the chillies have completely dried out before storing. Firstly thoroughly wash your chillies, drain and dry well. This is the traditional method of drying and is commonly used throughout the world for preserving chillies. This method is very simple and it relies on having access to the right location to achieve the best results. Tie (or thread) the chillies at their stems along a length of string or heavy cotton thread. Keep them well spaced and avoid letting the chillies touch as much as possible (because it is paramount to have excellent air circulation). However tightly threaded chillies look fabulous hanging in a kitchen, this can be done after they have completely dried and they can be bunched up for maximum effect. You have to bear in mind though this is really just an aesthetic use for dried chillies, as they lose their flavour if stored in the open air. Hang the string in a very dry, airy but warm location - having direct sunshine will assist in the drying process but can also bleach the fruit so best to shoot for somewhere that is bright without extended sun exposure. Depending on how dry the atmospheric conditions are will determine how long the chillies will take to fully dry....... a bit like just how long is a piece of string? Having said that though, the chillies should be dry in a week or so under dry conditions. If it is far too humid to even attempt the air drying method (and we all know that the Coffs Coast can be very humid) perhaps this method might have better and more consistent results for you. 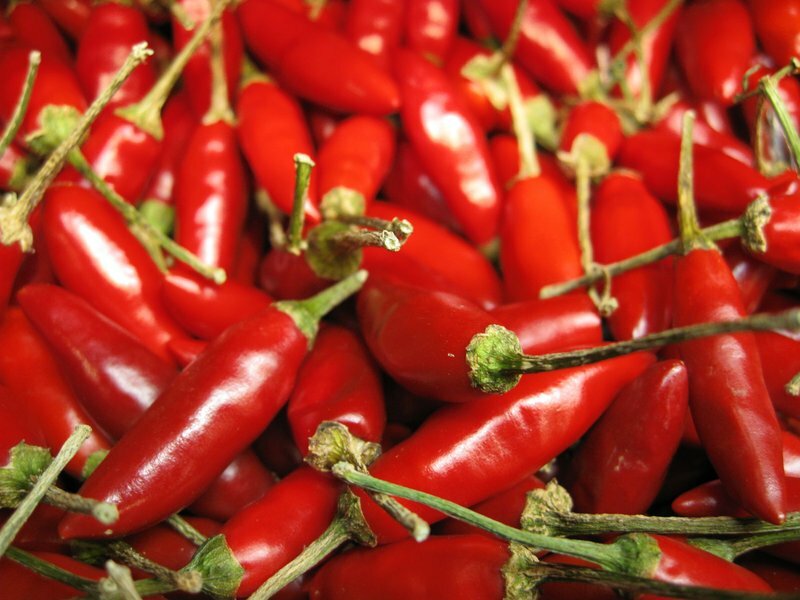 Place your chillies on a non-stick baking tray, or lined baking tray in a single layer without touching. Have your oven at the lowest setting (you don't want to actually 'cook' the fruits), turning the fruits every hour or so for even drying. If they start to burn or sizzle - folks you've got the oven too hot..... remove the chillies, and reduce the temperature before returning them to the oven. Some experienced folk actually dry their chillies like this overnight - might be best to start off during the day when you can 'keep an eye' on the process before attempting the overnight method. Chillies once dried should be stored in an airtight container whole in a cool, dark place. Stored for long periods, these chillies will lose some of their 'heat' and flavour but they should be OK until your next crop matures. Dried chillies can be ground up finely for chilli powder or added to other herbs to make excellent rubs. Chilli salt can be made easily by roughly pounding (or crumbling) the dried chilli and adding to salt. 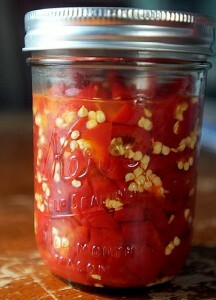 Curing chilli is very simple too - mince fresh chillies, place in a jar with salt and thoroughly mix. This mixture can be used immediately, but the flavours will develop and intensity as it matures. If a liquid develops at the bottom of the jar, either add more salt, or drain it off for use as a very powerful liquid seasoning. Once the salt has soaked up all the liquid, it will last indefinitely in a cool, dark place and can be used in any dish that requires an intense salty heat.